If this is what you see whenever you turn around, don't worry, there are ways to help your corgi and yourself! Your corgi may have a tail, but you shouldn't. Following you from room to room may mean she thinks she can't leave you alone, or that she needs something in her life -- companionship, exercise or entertainment. Changing some of your behaviors and your dog's will get her to stop following your every move. Establish with your corgi that you are the pack leader. Although your corgi seems totally codependent as she follows you from room to room, she's really showing you she thinks she's the leader. In a dog pack, only the alpha dog is allowed to leave the group on her own. That's why your dog follows you when you leave the room without her -- she thinks she's got to keep an eye on you. Adopting the alpha dog behaviors for yourself will demonstrate to your corgi that you're watching her back, not the other way around. Never be the first to break eye contact with your dog. This is a simple and effective way to demonstrate your position as the alpha. Holding eye contact forces your corgi to defer to you by looking away first. Feed yourself first. In a dog pack, the alpha gets first choice of food. If this isn't your typical habit, your dog may look shocked when you sit down to a meal and her bowl is empty, but after a while she'll learn that yes, she will get to eat, as soon as you're done with your dinner. Practice leaving your dwelling and coming home without acknowledging your dog. This demonstrates that you're allowed to come and go as you please. When you leave, don't say goodbye or pet your dog. Acting stressed or rushed as you're headed out will alarm your dog, so keep calm. When you return, even if your dog comes running and immediately starts her "tail" routine, don't acknowledge her. Instead, put down your keys, take off your jacket and shoes, go get a glass of water -- do whatever you would normally do when arriving home, but without giving your pup any attention. Once you're settled in, give your dog a brief pat, say hello, and tell her she's a good girl. This will teach your corgi that you coming home is not a big deal, and that you set the tone for your interactions with her. Once your corgi understands that you're the leader, not her, you can practice her "sit," "stay" and "lie down" commands when you walk away. Start small, only taking a few steps back from your dog after giving the "stay" command, and work your way up to walking out of sight before giving her the OK to come find you. If she follows you before she's called, ignore her. Start another training session later. If she complies, call her to you and give her a treat and some praise. After a few active training sessions, you should be able to say "lie down," then "stay," then carry out your business without feeling the cold press of a corgi nose on your heels. Giving her a toy to occupy her before you leave will reinforce her good behavior. Exercise your corgi regularly. Your dog may be following you because she's bored and is hoping for a walk. 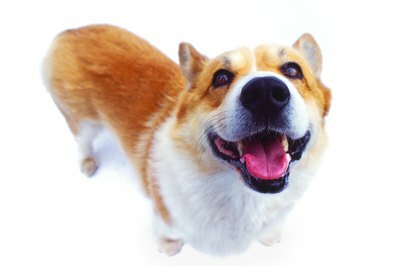 Welsh corgis were bred as herding dogs and need daily activity to be happy. Make sure your corgi gets at least an hour a day of good exercise. Split this into shorter sessions or between walks and playtime if you need to. Burning off her extra energy will help her feel more settled at home and she won't bug you as often. After a good long romping session, she'll probably be too pooped even to get up from her dog bed! Carve out time from your schedule just for puppy loving. Corgis are pretty independent creatures, but they still need your love and affection. In addition to exercise, take time out to sit with your corgi, pet her, and tell her what a good dog she is. If she gets that one-on-one time with you daily, preferably at the same time each day, she'll know that she's loved and won't have to come asking you for attention when you're busy with other things. Keep your corgi busy when you're not around. 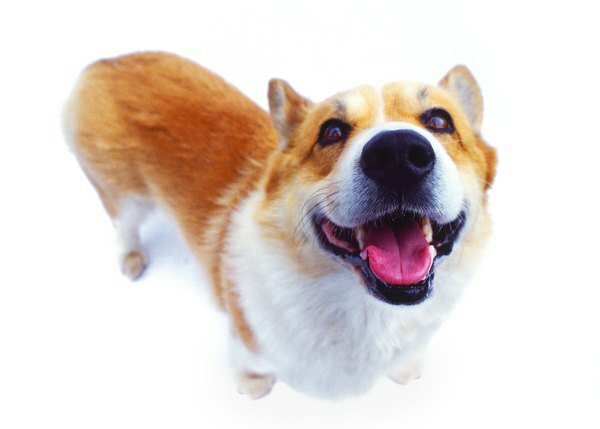 Welsh corgis are intelligent and energetic -- if you're out of the home for many hours a day, your dog will get bored and lonely with nothing to do. A Kong or other treat toy filled with peanut butter and doggie cookies provides an entertaining activity for your pup. She'll lick and gnaw at her toy for hours in an effort to get every last bit of deliciousness. Set up a perch so she can look out the window and watch the neighborhood comings and goings. Ask a friend to take her for a midday walk or play session with his dog. Before you leave, hide all your dog's toys around your home so she has to go look for them before she can play. All these activities will fill the hours your furry friend is alone so she won't be so needy when you're home. Don't free-feed your dog. Teaching your dog that she depends on you for food is another way to demonstrate your position as pack leader. When playing with your corgi, never play a game you can't win. Winning the game means you are the alpha to your dog.